Invasive measures of endothelial-dependent coronary artery vasoreactivity predict cardiovascular event rates [1, 2]. We previously demonstrated that endothelial-dependent coronary vasoreactivity (EDCV) can be measured non-invasively by combining 3 T coronary MRI and isometric handgrip exercise . Although coronary vasoreactivity is likely a stronger a predictor of cardiac events than similar measures in peripheral arteries such as the brachial, there are several coronary MRI techniques in use but no currently standardized protocol for non-invasively assessing EDCV. We assessed EDCV with 3 T MRI at regular time intervals before, during and after isometric handgrip exercise using two different cine pulse sequences, gradient echo (TFE) and spiral. Fifteen healthy, fasting subjects (8 female), age 28.9 ± 5.0 years were placed prone in a 3 T MRI scanner equipped with a 6-element cardiac coil. Thirteen subjects had adequate scans for analysis. After scout scan determination of proximal coronary orientation, a dedicated TFE cine sequence (FOV = 350 mm, slice thickness 8 mm, Matrix = 400, spatial resolution = 0.8 × 0.91 × 8 mm, temporal resolution = 47 ms, TR = 5.8 ms, TE = 3.5 ms, flip angle = 15°, BH duration = 15 sec, TFE factor = 8, SENSE, no fatsat, triggering = retrospective) perpendicular to the coronary artery of interest was acquired. A spiral sequence (FOV 300 mm, Matrix = 336, TE = 2.1 ms, Flip angle = 20°, BH duration = 15 sec, acquisition window = 17 ms, temporal resolution = 22.7 ms, spatial resolution 0.89 × 0.89 × 8.0 mm, SENSE = no, fatsat = spectral spatial, triggering = prospective) was then performed at the same anatomical level. 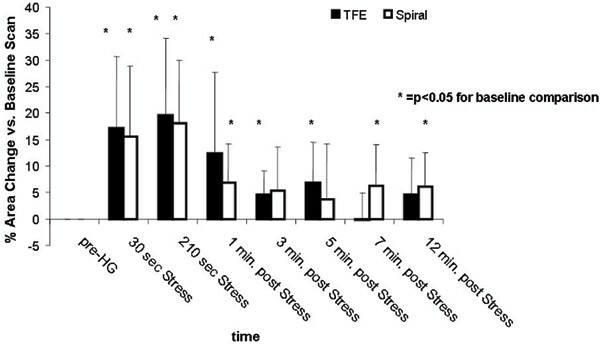 Alternating TFE and spiral images were obtained at regular time intervals at baseline, during 4 minutes of continuous isometric handgrip exercise at 30% of each subject's maximum, and for up to 12 minutes of recovery. The images were analyzed for cross-sectional area changes using automated software employing full-width-half-maximum criteria (Cine version 3.15.17), see Figure 1. The total number of analyzable frames was counted by consensus reading for each method. Results are presented as mean ± SD. A T2 localizer was used to obtain a perpendicular view of the right coronary artery (RCA) in panel A. Panels (B) and (C) demonstrate visualized RCA (arrows) in the resting TFE and spiral sequences. The LAD artery was studied in four subjects and the RCA in nine. Both pulse sequences demonstrated significant exercise-induced changes in cross-sectional area from baseline values (Figure 2). The average change from baseline was ~20% and was not significantly different between sequences neither at 30–60 seconds (p = 0.79) nor at 210–240 seconds (p = 0.82). The cross-sectional areas were significantly larger by the spiral sequence during the baseline measurements (TFE: 11.0 ± 2.7 mm2 vs. spiral: 13.6 ± 2.0 mm2, p = 0.0001) and stress (p < 0.01 at 30–60 sec and 210–240 sec. ; data not shown). There was no significant difference between the early and late stress-induced arterial areas for each method (TFE 30–60 seconds: 12.8 ± 3.7 mm2 vs. 210–240 second: 13.0 ± 3.8 mm2, p = 0.55 and 30–60 second spiral: 15.6 ± 3.9 mm2 vs. 210–240 second spiral: 15.9 ± 2.2 mm2, p = 0.74). By 7 minutes into recovery the cross-sectional areas had returned near baseline. At baseline the average total number of analyzable frames was 17.4 ± 6.5 for TFE and 23.2 ± 7.4 for spiral, p = 0.04 while at stress the total numbers were not significantly different (TFE: 16.8 ± 7.6 vs. spiral: 18.5 ± 9.8, p = 0.53). Percent coronary artery cross-sectional area changes by pulse sequence during and following isometric hand grip exercise. Non-invasive measurement of coronary endothelial-dependent vasoreactivity is possible by combining isometric handgrip, 3 T coronary MRI and either TFE or spiral pulse sequences. Although fat-saturated spiral results in larger observed cross-sectional areas possibly due to off-resonance effects at 3 T, both sequences are adequate for these sequential measurements. The spiral method has a higher temporal resolution (23 ms vs. 47 ms) while maintaining both spatial resolution and breath-hold duration. This leads to a modest increase in the number of analyzable frames. Both methods clearly show a similar percentile stress-induced cross-sectional area change compared to baseline. Because SENSE is not necessary with spiral, quantitative SNR and CNR measurements may be more easily obtained. Isometric handgrip leads to early endothelial-dependent dilation at 30–60 seconds that is sustained throughout the handgrip exercise and quickly returns to baseline. For future studies we suggest the use of spiral imaging at baseline, during the first 4 min of handgrip exercise and after 4–5 minutes of recovery.